It is estimated that 16-18 million individuals are infected worldwide, and roughly 50,000 people die each year from chronic Chagas disease (World Health Organization). Buffy coat examination and xenodiagnosis used to be the most commonly used methods for the diagnosis of acute T. cruzi infection. However, both methods are either time consuming or lack sensitivity. 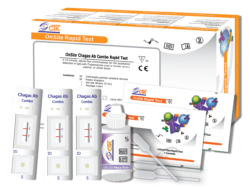 Recently, serological testing became a mainstay in the diagnosis of Chagas disease. In particular, recombinant antigen based tests eliminate false-positive reactions which are commonly seen in the native antigen tests.